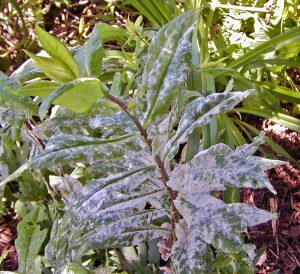 Powdery mildew is a common term for a disease that occurs on the above-ground parts of many plants. The name refers to the white, powdery appearance of infected leaves and stems – they often look as though someone has sprinkled them with talcum powder or powdered sugar. 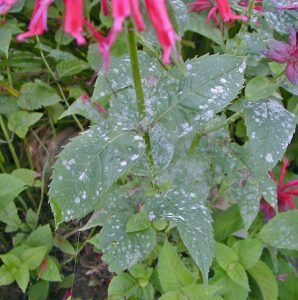 Powdery mildew is common on many garden plants. 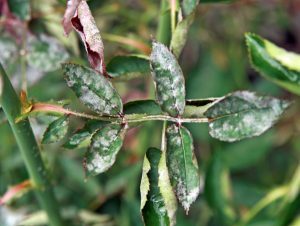 People have had to put up with powdery mildew for a long time: the disease on roses was mentioned in 300 B.C. An epidemic of powdery mildew on grapes spread rapidly through Europe during the 1840s and 1850s, threatening the wine industry. The fungus responsible was probably introduced from the U.S., where it occurs on the native grapes (but these grapes have some resistance to it). 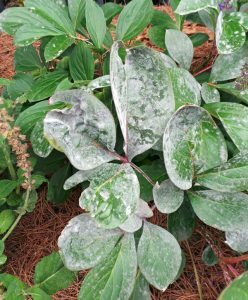 Powdery mildew is still a scourge on many ornamentals and food crops around the world every year. This disease occurs on many herbaceous perennials, shrubs and trees, but does not affect conifers. 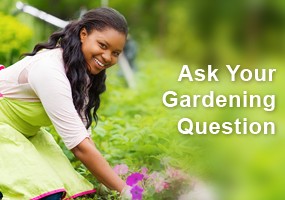 Some garden plants that commonly get powdery mildew include apple, ash, bee balm, chrysanthemum, cosmos, crabapple, dahlia, delphinium, honeylocust, honeysuckle, hydrangea, lilac, maple, phlox, roses, snapdragon, sweetpea and zinnias. Powdery mildew on bee balm. The genus Erysiphe causes powdery mildew on many vegetable crops and flower plants and can have a dramatic impact on production or appearance. E. cichoracearum is found on aster, bee balm, helianthus, phlox, squash, verbena and zinnia. E. cruciferarum affects crucifers. E. polygoni can cause powdery mildew on beans, beets, cabbage, cantaloupe, clovers and other legumes, cucumber, delphinium, and hydrangea. Fungi in the genus Blumeria were once classified in the genus Erisyphe, but have been reclassified in their own group. They are the only genus of powdery mildew fungi that affect monocots (corn and grasses). B. graminis causes powdery mildew on barley and wheat. The genus Phyllactinia is found primarily on trees, but generally causes only minor damage. P. corylea causes powdery mildew disease of ash, birch, dogwood, elm and oak. P. guttata causes powdery mildew disease on beech, birch, dogwood, elm, honeylocust, magnolia, oak and pecan. Powdery mildew on zucchini leaf. The genus Sphaerotheca causes powdery mildew on roses, hops, berries, tree fruits, and some vegetables, and even dandelions. 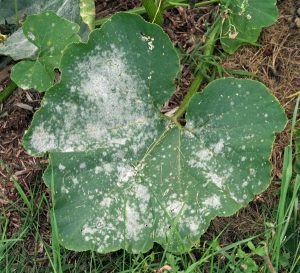 S. macularis causes powdery mildew on hops and strawberry; S. pannosa causes powdery mildew disease on roses, peach, nectarine, and apricot; and S. fuliginea attacks zucchini and other squash, and cucurbits. The genus Podosphaera is found mainly on fruit trees. 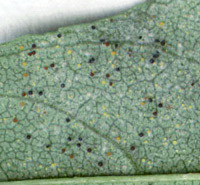 P. leucotricha causes powdery mildew on apple, pear, and quince, while P. oxyacanthae attacks apricot, cherry, peach and plum. The genus Microsphaera causes powdery mildew on ash, birch, blueberry, dogwood, elm, lilacs, oaks, pecan, rhododendron, and viburnum. M. penicillata affects dogwood, lilacs, oaks, pecan, and rhododendron. M. calocladophora is found only on oaks. The genus Uncinula commonly affects grapes, and some trees. U. necator infects grapes. Scarlet sage is susceptible to powdery mildew. Powdery mildews are easily identified by microscopic examination of the different fungal structures (cleistothecia, conidia, and conidiophores; see next paragraph for definitions). 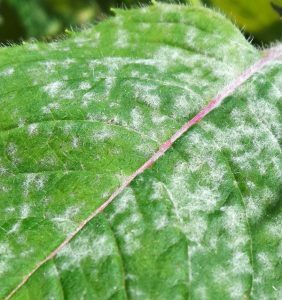 A Key to the Genera of Powdery Mildew Fungi is available for those so inclined to know exactly what type of fluffy white fungus is attacking their plant. 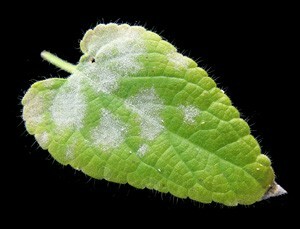 The fungus that causes powdery mildew grows mainly on the leaf surface. The fungus grows primarily on the leaf surface and puts specialized feeding structures (called haustoria) into the epidermal layer of the plant to absorb water and nutrients. Powdery mildews are obligate parasites (i.e., they require living plant tissue to grow). The characteristic powdery white material on infected leaves is a conglomeration of structures that produce spores (conidiophores) and the spores themselves (conidia). The black cleistothecia can sometimes be seen on the underside of the leaves in fall. Tiny, yellow (younger) to black (older), sexual fruiting structures (cleistothecia) are sometimes seen late in the season on the lower surface of leaves. This is the structure that usually overwinters in cold areas like Wisconsin. High humidity promotes the development of powdery mildew, as on this peony. When weather conditions are favorable, the disease often develops on a wide range of plants. High humidity promotes disease development, making it a common disease in the Midwest this time of year, especially when cool, damp evenings follow warm days. These fungi are unusual compared to most plant disease fungi because they do not cause infection when the leaves are wet; they just require high humidity during infection. However, they produce more spores when the humidity is low. Powdery mildew causing curling on rose leaves. Young growth is most susceptible on most plants. The fungus can grow on all aboveground parts of plants, including both sides of the leaves, stems, flowers, and fruit. Many powdery mildew fungi only grow on the top side of the leaf, but some will grow on both sides. Fungal growth may completely cover the leaf, or may appear only in patches. Severely infected foliage may be yellow, distorted or stunted. Disease can spread rapidly (3 days) when conditions are optimal, but it usually takes 7-10 days from infection until symptoms develop and secondary spore production occurs. Fortunately, powdery mildew is only a cosmetic problem on most plants. It will make the plant look a little ragged, but it doesn’t kill the plant. Select powdery mildew-resistant varieties when available. This won’t completely eliminate the disease, but it will help disease severity. Reduce humidity around the plants. Obviously you can’t change the weather, but you can change the microhabitat around your plants. Increase the spacing between plants to increase air flow. Place plants where they will receive morning sunshine and dry out more quickly, if possible. And don’t overwater. Avoid overfertilizing, since high nitrogen promotes tender leaf formation, and promotes dense stands that are more likely to become infected. Remove and destroy severely infected plants, if possible. Clean up infected plant debris in the fall to reduce overwintering fungal structures that will produce spores during the next growing season. Severe, repeated infection of valuable plants may require fungicide treatments. 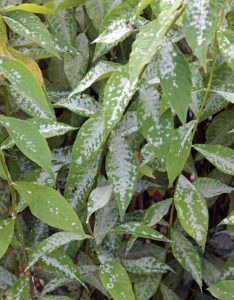 In some cases and for some plants, however, powdery mildew can cause severe leaf loss and yield reduction in vegetables. In this case fungicide applications may be necessary to reduce or prevent injury. A number of fungicides are registered for use against powdery mildew. Regardless of which type you select, be sure to READ THE LABEL and FOLLOW THE INSTRUCTIONS to make sure you use the fungicide in the most effective manner possible. Note that not all products are registered for use on vegetable crops, and sulfur can be damaging to some squash and melon varieties! 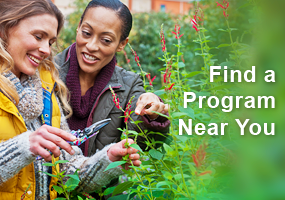 Begin treatment on valuable plants when symptoms appear to prevent the disease from spreading. An alternative to commercial fungicides is to spray approximately once a week with a solution of baking soda (1.5 tablespoon/gallon) and horticultural oil (3 tablespoons/gallon). If spacing my zinnias apart more next year doesn’t work on powdery mildew, I will use the baking soda and horticultural oil. I had tried thinning my plants to no avail. Will try the baking soda/hort oil next year in early August which is when this culprit seems to appear in my garden. I have powdery mildew this fall on my bee balm for the first time. I am going to go out and get rid of the plants that are most affected. I am also going to buy some horticultural oil. I almost always get powdery mildew on my zinnias and rudbeckia. May have to try the baking soda solution. We have some gorgeous peonies in a parking lot island flower bed in our city that have been plagued with powdery mildew for a few years. We have altered our planting of annuals around them, so that the plantings are not as dense, using more specimen plants spaced farther apart, rather than a varieties that are more attractive planted closely together. In the past, we’ve used tall, and bush-like zinnias, but found that these are covered with powdery mildew in that bed as soon as they mature. We also instruct our helpers to water the ground, not the foliage, and a volunteer has been spraying with horticultural oil. We haven’t tried adding baking soda but we will now that we know. The bed looked better this year than it has in quite a while. Thank you for information on the organic control of powdery mildew. I had been unaware of that solution. I’ve been enduring powdery mildew on my bee balm plants for years – they are now at a point where removing them seems like the only option. It was interesting to note that it grows on serviceberry trees – now I know what I’m dealing with there. I’ll look to be more pro-active before it emerges with the baking soda/horticultural oil solution. I have problems with powdery mildrew on my phlox. I will destroy the infected plant debris this fall to reduce overwintering fungal structure. Surprised at the number of types of powdery mildew. I have noticed over the years that certain cultivars, bee balm, phlox, certain dahlia cultivars and certain weeds are much more likely to host PM. I have found that treating plants before symptoms appear is best method of control. I had powdery mildew on my bee balm and cucumbers this year. Good to know about the baking soda method vs chemicals. The history of powdery mildew was very interesting, especially the damaging effects to the wine industry; this is certainly a problem that continues to exist today. Thank you for the recipe for organic fungicide. I will be referencing this article again to ensure proper planting techniques for control of powdery mildew. I made a significant change in the flower beds and hanging baskets here this year. Moved away from hand watering everything to an automated drip irrigation system. Wasn’t hard and not to expensive. Saved me a lot of time to do other things, but I found I was not paying as much attention to plant health. Made a big difference, this year was the first year I didn’t have to battle the mildew, even with all the moisture we have had. I didn’t realize that powdery mildew is caused by so many closely related species of fungi and are obligate parasites that require high humidity but produce more spores when the humidity is low. I have powdery mildew on my squash plants. Fortunately it has not spread to anything else. I will clean up the plants and try the baking soda and horticultural oil next year. Next year I will try the baking soda and horticultural oil spray on my squash to hopefully reduce or eliminate powdery mildew. I have an enormous amount of powdery mildew on my plants this year. Everything seems to have it somewhere. I am curious about this baking soda remedy, I am going to look it up and definitely try it. Also the idea of planting so that there is more area for air circulation makes a lot of sense to me. I started cutting down my foliage in fall to hopefully stop the spread of the fungus. Remove and destroy severely infected plants. I have frequently had powdery mildew on some lilacs, especially those growing next to our home. I have come to expect it. But this year it has appeared on the service berry tree on the west side of our church, not the one on the east side. Although it may be getting hours of sunshine, it is in the bed of newer plantings and probably is overwatered using an above ground sprinkler system. We’ll make adjustments in the amount of water for next season and observe. I ALWAYS SEEM TO HAVE POWDERY MILDEW ON SOMETHING EACH YEAR, MAINLY SQUASH AND PHLOX, THE ONLY PHLOX THAT DOES NOT GET IT IS THE DAVID VARIETY. Good information. Its a problem on my bee balm. I will try the baking soda solution. I love the home remedy tips!!! The cantaloupe in our garden developed powdery mildew this year and it didn’t take long for it to spread. Now I have a way to fight it next year. Thanks. I have had powdery mildew on my bee balm and was interested in how to eliminate it. I was glad to read of the one method of having the plants farther apart so they dry out in the morning sun and not overwatering them-which I have been guilty of when I am going to be gone over an extended period. The baking soda idea is also very helpful!! I am familiar with powdery mildew on some garden vegetable plants as I have seen it in my garden. Less so in recent years which is probably related more to what I choose to grow than anything else. I wasn’t aware that powdery mildew can be a problem on trees. Since it is related to humidity, are inner leaves or the leaves of trees planted close together more likely to have powdery mildew? Great option to use the baking soda/hort oil solution. Hopefully this is pet friendly? What is “horticultural oil” and where can I get it? Horticultural oils are lightweight oils used for pest control. There are dormant oils (to be used when plants have no leaves) and summer or all-season oils that can be sprayed on foliage. 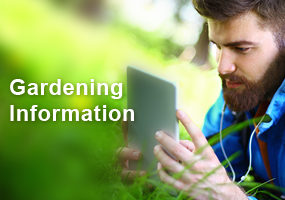 many different types are available from nurseries, garden centers and online. This is the first year I have had powdery mildew on my Bee Balm. I was so disappointed. I have it almost every year on my lilac and this year sprayed the fungicide very early to help curb the growth of the fungus. Better but still annoying. I didn’t realize that the mildew can also grow on the under side of the leaves as well. I also didn’t know that there were such a variety of powdery mildew fungi. I am going to look more into the baking soda solution. Thanks for the tip.